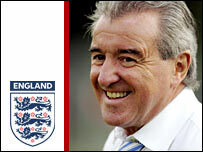 Terry Venables is back in the spotlight after being appointed part of England manager Steve McClaren's backroom team. It is a move that will go down well with most players, pundits and fans but maybe less so with those in the Football Association's corridors of power. Venables has the reputation of an archetypal lovable rogue with his cockney charm and disarming smile. He is a man just as at ease in a tracksuit training among players as he is in a tuxedo at a cocktail party with the rich and famous. He may be a so-called people person but the charismatic 63-year-old's chequered history off the field, which has seen him disqualified from being a company director in the past, is what worries parts of the establishment. On the flip side, his ability to court controversy off the field is only matched by his expertise on it when it comes to football. As a manager he is famed for his tactical nous and ability to motivate players into producing their best. 1983: Guides QPR to Division Two title. Becomes major QPR shareholder and managing director. 1985: Steers Barcelona to first Spanish League title in 11 years. It was under Venables' tenure as England manager that the national team arguably played their best football of recent times, back in Euro 96. Venables led the team to a 4-1 win over the Netherlands in a win etched firmly in the memories of England fans, not just because of the result, but the style of the performance. But not even Venables could stop a familiar end to the tournament held on home soil as England went on to lose on penalties to Germany in the semi-final. Earlier in his career, Venables made his name in management with spells at Crystal Palace and Queens Park Rangers before his exploits saw him appointed Barcelona coach. He was dubbed El Tel and guided the club to a Spanish League title, a League Cup win and a European Cup final - which they lost on penalties to Steaua Bucharest - before being sacked in September 1987. 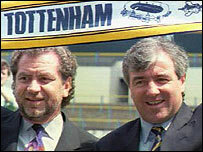 He took over at Tottenham later that year and won the FA Cup with the club in 1991 before taking a role upstairs as chief executive at White Hart Lane as Sir Alan Sugar took over the club. But a deteriorating relationship between the two led to his acrimonious exit in November 1993, which saw matters end up in the High Court. England came calling next and he took over as manager in 1994. In 23 games, he won 11, drew 11 and lost once before his exit after Euro 96 but a key feature of his tenure was his ability to relate to his players and get the best out of them. He then had an unhappy spell as consultant and chairman of Portsmouth and failed in his attempts to lead Australia to qualification for the 1998 World Cup. A foray back at Palace did not go well as the club found itself struggling for money and form. But Venables restored some of his ailing reputation when he was brought in as Bryan Robson's assistant at Middlesbrough and helped the club avoid relegation in 2000. He did not stay at the Riverside long and went on to manage Leeds in July 2002 but left less than a year later as the club spiralled into financial crisis. Venables has enjoyed being a television pundit for the past few years and is believed to have recently turned down the chance to manage Boro because he did not want to take on a full-time post. In that respect, his new England role is ideal and both he, and England's fans, will hope he can restore the spirit and style of Euro 96.